Enzo Scionti is determined to continue to shine at the forefront of the OK-Junior category in international competition this season. Leaving behind the problems that reduced his race programme in 2018, he is eager to return to the European circuits with big ambitions. As well as his speed, he can also count on his sense of attack and his ability to handle events to quench his thirst for results. In the second half of last season, Enzo was able to secure the confidence of a major official team, the CRG factory, with his unwavering motivation and ambition to succeed. He will now be able to capitalise on these essential skills to give free rein to his talent during a particularly promising international programme in 2019. 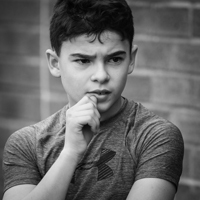 For Enzo, the main goal of the season, which will start soon, will be the FIA ​​Karting Junior European Championship and World Championship competitions. He will also participate in some WSK Promotion events such as the Super Master Series and the Final Cup at the end of the year. His involvement in the German DKM Championship will give him additional opportunities to compete with the top specialists in the Junior category. He will also compete in the OK-Junior French Cup to prepare for European competitions taking place in France as well as possible. Taking advantage of extremely powerful CRG chassis, Enzo will start the 2019 season with all the cards in hand to finally realise his strong potential only glimpsed up to now, thanks to a complete international programme.